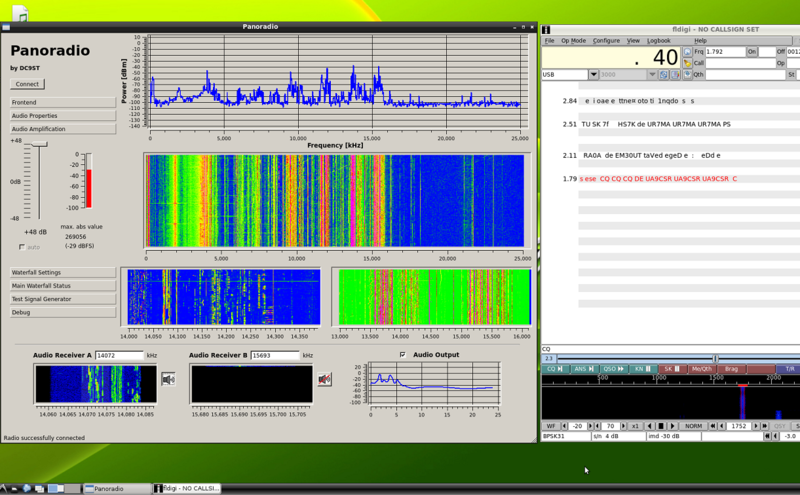 The Panoradio is a modern software defined radio receiver, that directly samples the antenna signal with 250 MHz with an analog-to-digital converter. The receiver has a unique panorama function: it captures and displays signals from 0-100 MHz simultaneously and can even receive signals from the 70 cm band with undersampling. The hardware platform is the Zedboard, that features the state-of-the-art Xilinx Zynq Soc, that combines a FPGA with an ARM A9 dual core which runs a Linux operating system on an SD card. The radio can operate in standalone mode with just a monitor and mouse attached. The front panel provides access to HDMI, Ethernet, Audio jacks, USB and the programming interfaces. The three SMA jacks are the inputs for the 100 MHz mode, the direct path and the 70 cm mod. The inside view shows the Zedboard (green) and the ADC board (blue) with the anti-aliasing filter being in the lengthy metal case on the left. In the upper right the relays for switching and their control circuit can be seen. The squared metal box contains the 70 cm frontend. Because of the large heat dissipation of the AD converter a fan is mounted at the front panel. 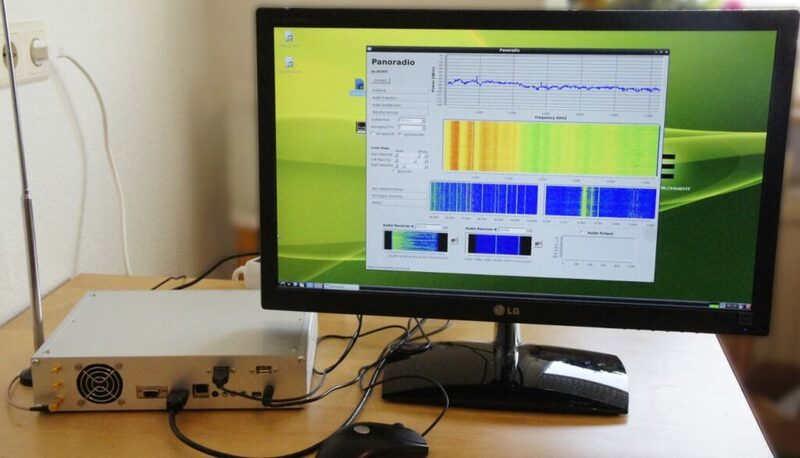 The software defined radio is partitioned in four parts: analog frontend, AD conversion, high speed FPGA processing and software implementation. 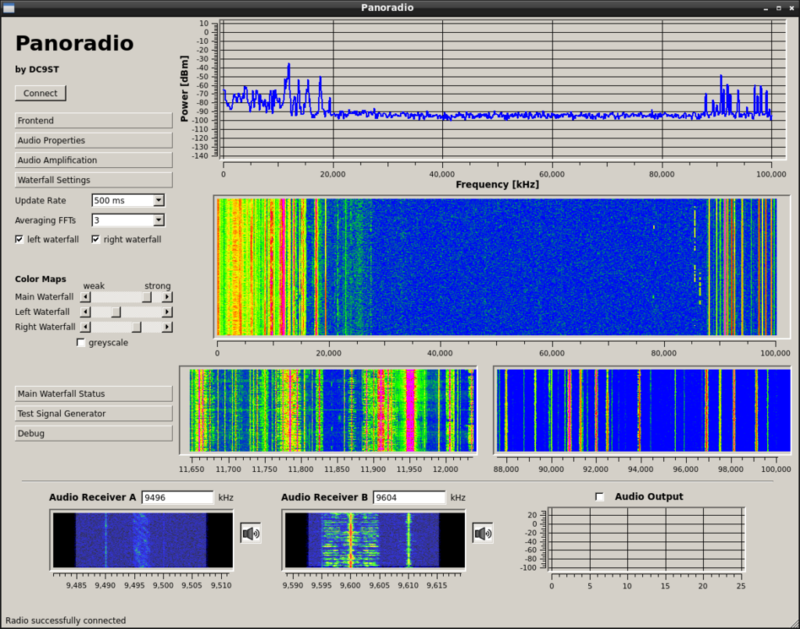 This website explains the analog and digital hardware of the Panoradio SDR, the radio architecture (in VHDL and C++) and provides basic information on the advantages of direct sampling receivers.